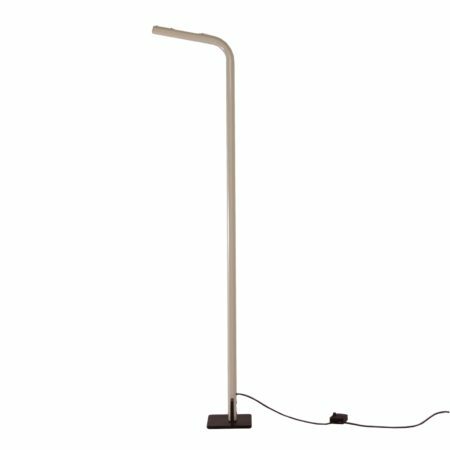 In height adjustable vintage floor lamp with Chrome sphere made in the seventies. The sphere is adjustable for indirect light on the wall or ceiling or direct light for reading. The height is also adjustable. The designer or manufacturer is unknown to us, probably Dutch, Anvia or Herda. Dimensions: h x w x d = 138 – 165 x 23 cm (diameter sphere). Diameter foot 25 cm. Material: iron, chrome. Colours: black and chrome colour.